Surgeon played an awesome three hour set here in Sydney on Saturday night. He blew our minds! Taking us on a fantastic journey of new and old techno, dubstep and electronica sounds and more. His set was very dynamic, with changes of intensity, twists and turns, deepness, darkness, and some unexpected blasts from the past, lots of memorable music. I felt inspired and totally musically satisfied afterwards. I had a great jump around on the dance-floor at the front, the three hours went by in a flash, never a dull moment. It was a really fun night, great venue, excellent sound, large techno/music passionate crowd showing vocal appreciation, lots of new/young and old/old-school friends and familiar faces about. The heavy rain we were met with leaving the venue at 2am (venue close) couldn’t dampen our spirits afterwards. I’m still on a high after this night, almost a week later. I think I’ll ride this buzz all the way to seeing Jeff Mills @ Stereosonic next month, and not spoil it with anything in-between, nothing would be good enough. 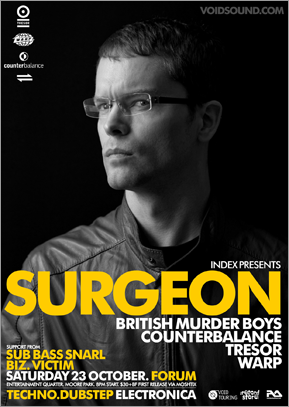 I’m really impressed with how different each of the Surgeon sets I’ve seen this year have been; Berghain in Berlin had a lot more deepness and dubstep sounds, Cable in London had more electronica/melodic (he even played some disco!) sounds, and now the Forum in Sydney with a hard/tough techno set. My partner Joanne also saw his Brisbane and Melbourne performances as well, and mentioned the same, each performance being quite different in feel/sound. He certainly gave us a spanking (as he mentioned on his twitter) in Sydney. A couple of IDs are from some ITM crew, thanks! I’m pretty sure there were some other Surgeon and B.M.B tracks/loops played. There was also a heap of other stuff I didn’t know, and I love that; some acid, brutal techno, dubstep, and broken-beat, dark electronica sounds. Thanks to everyone who made this tour come together. Joanne and I also got to hang out with him for a few hours on Sunday and chat over brunch, he’s a really nice guy, much respect. He’s just added the complete track-list to his blog, for his live set in Sydney, awesome!